HYPERHIDROSIS = excessive secretion of sweat by the eccrine sweat glands. In medical science, the term "hyperhidrosis" is used when sweat secretion exceeds 100 mg of sweat per cm2 and minute. In clinical practice, however, the definition is more subjective and implies an excess of sweating that causes discomfort and/or a series of difficulties in daily life, exceeding the body's physiological requirement of sweat to keep the body temperature at a normal level. The activity of the sweat glands is not constant but varies during the 24 hours, reaching minimum levels during night time and peaking during physical exercise, psychological or psychophysical stress, heat exposure etc. Among other factors determining the level of humidity of the skin is the degree of evaporation, markedly reduced in humid climatic environment or when covering the sweating surface (e.g. closed shoes). BROMHIDROSIS = sweat with unpleasant odor. Bromhidrosis is often associated with hyperhidrosis, but excessive sweating is not necessarily causing unpleasant odor. On the contrary, the sweat itself is an odorless liquid when it is expelled from the sweat glands. The odor is caused by organic substances, splitted by microorganisms which colonize the skin surface and the material of socks and shoes. The molecules produced by such biochemical processes, mostly derivates of butyric acid, are dissolved in sweat and emit the characteristic odor of sweaty armpits or sweaty feet when evaporating. The sweat itself contributes to the creation of an environment in which the microorganisms thrive and proliferate and represents the vehicle for malodorous substances. Moreover, even in absence of bacteria and fungi, an unpleasant odor may be emanated from the cloths or shoes when traces of organic substances contained in the tissue or in the leather are dissolved in the sweat. This is a far more frequent condition than secondary hyperhidrosis and appears, generally, localized in one or several locations of the body (most often hands, feet, armpits or a combination of them). Similar to the most common form of high blood pressure, hyperhidrosis is due to a sub-optimal setting of the regulatory mechanism, responsible for body temperature and skin moisture, in the centers of the sympathetic nervous system. 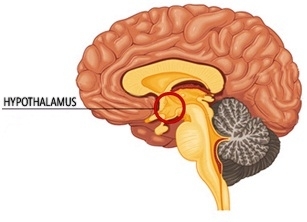 This body's thermostat is located in an area of the brain stem called hypothalamus. This "programming error" is often determined by genetical factors, at least the predisposition to develop a hyperhidrosis. Hyperhidrosis usually starts during childhood or adolescence and persists during lifetime. Nervousness and anxiety can elicit or aggravate sweating, but psychological/psychiatric disorders are only rarely the cause of the condition. Excessive sweating of the hands is, generally, by far the most distressing condition. The hands are much more exposed in social and professional activities than any other part of our body. Many individuals with this condition are limited in their choice of profession, because unable to manipulate materials sensitive to humidity (paper etc) or reluctant to shake hands; some patients arrive to the point to avoid social contact. The degree of sweating varies and may range from unpleasent moisture to profuse dripping. Most patients notice that their hands not only feel moist, but also cold. Palmar hyperhidrosis has often a familiar/genetical background and is usually combined with sweaty feet (palmoplantar hyperhidrosis).Severe forms affect approximately 0.2% of the population (or about 1/10 of people affected by hyperhidrosis). It is the most common form of hyperhidrosis and affects about 8 in 10 people who suffer from hyperhidrosis, ie about 2% of the population. The main problem is the formation of large wet marks or even halo-like annular salt deposits on the clothes, which the affected person perceives as very embarrassing and therefore seeks to hide if possible. However, if combined with palmar hyperhidrosis, axillary sweating is usually considered as a minor problem. Sweat pouring down from the forehead in stressful situations can be very embarrassing, inducing the patient to fear that others may consider him/her nervous and insecure. Sweaty feet is a common condition but in the vast majority of cases this phenomenon occurs in a moderated, acceptable fashion. Hyperhidrosis is a condition where sweating is so heavy that it occurs even without wearing shoes or resulting quickly in drenched footwear. The resulting slipperiness makes it very difficult to walk barefoot on smooth floors, to wear sandals or open shoes, and closed footwear is destroyed by the amount of sweat within short time. Less frequent locations are the trunk, the inguinal area, the intergluteal fold, on the thighs/legs or other circumscribed focal areas. Compensatory sweating is frequent in patients who have undergone surgery on the sympathetic nervous system. Compensatory Hyperhidrosis is a very severe form of compensatory sweating which occurs in a minority of these patients. The number of affected individuals and the intensity of the phenomenon depend heavily on the type of procedure adopted, to some degree also on individual (genetic) factors. Combinations of the listed types of hyperhidrosis are common. Sweating can appear suddenly as profuse sweating attacks or manifest itself more continuously. It can be elicited by high outside temperatures or emotional stress, or appears without any obvious reason. Generally, it worsens at the beginning of the warm season and improves during winter. In secondary hyperhidrosis, the underlying condition or the pathophysiological mechanism that leads to hyperhidrosis should be treated first. E.g. patients on endocrine therapy for prostatic cancer (castration, GnRH-analogues) with disturbing sweat attacks can get relief through the administration of antiestrogens (ciproterone acetate). Treatment of patients with primary hyperhidrosis or heavy sweating in patients with secondary hyperhidrosis, not treatable otherwise, are described in the following pages.